This banana clay tutorial is a quick guide for you to start. I am sure you'll have many more ideas for fruits miniature after this. 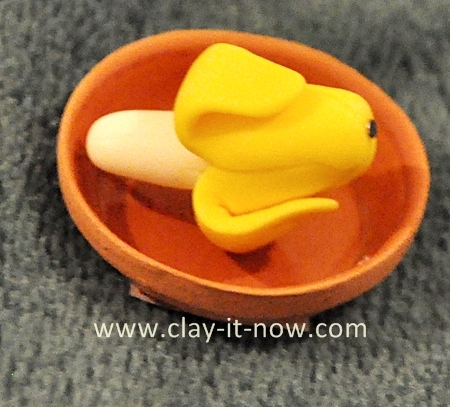 To create the peel, roll yellow clay to 3 small ball shape. Continue rolling the ball to the oval shape to about 15 mm long and flatten it with your index finger on a clean surface. Take your white clay now and roll it to small sausage shape with length of 13 mm (approximately) and diameter of 3 mm. Use your clay knife or ruler to draw fine lines on a sausage. If you want to use this fruit as jewelry beads later on, I would recommend you to insert the wire or pin at this stage before the clay dry. Now, attach the peel to the white sausage clay shape one at a time. Use white glue to secure the peel. Attach all three peels to the white clay up to half of the length. Make sure the bottom part of the fruit is well covered. To have the peeling effect, fold down the top part of the peel and bend it a little bit to make it looks natural. Feel free to paint the fruit after all segments dry completely. Apply one layer of varnish to protect the clay. 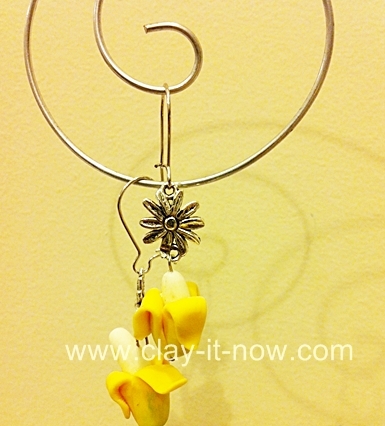 Most people use this miniature for earring, pendant or bracelet charm. 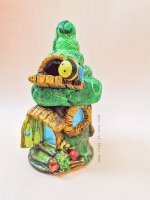 It can be used for doll house or even home decoration if you make them in bigger size. Here is the picture of my earring. Did you make this miniature? If yes, we want to see them. Please share your work with us by submitting your picture and comment using submission form below. Hm...Also, do you want to see more ideas about miniature fruits and foods? You might want to check out some of Miniature Clay Books we used. We have actually seen the banana tutorial in Polymer Cook Book.